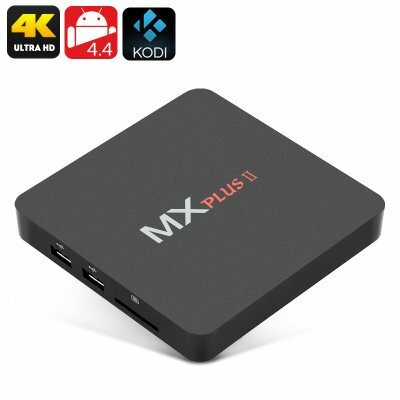 Successfully Added MX Plus II Android TV Box - Kodi 14.2, Quad Core CPU, 4K Decoding, Wi-Fi, Optical SPDIF, 3 x USB to your Shopping Cart. This MX Plus II TV Box is a fantastic choice for those who want to experience sooth video playback and games but done have the budget for the one of the latest devices. Kitted out with a Quad Core CPU and a Mali-450 GPU along with 1GB of RAM if offers proficient performance for gamers and movie lovers without emptying the wallet. This Android TV box has a modest 8GB of internal memory but by using the SD card slot this is extendable by up to 32GB, so you can happily download whatever you like and keep stored for easy retrieval when needed. With 4K support the MX Plus II allows you to play 4K files so you won't miss out on your favorite shows. Preloaded with Kodi 14.2 this TV box lets you take advantage of the most comprehensive multimedia streaming library with all the popular TV shows and movies at your fingertips. Wi-Fi support makes it easier to install the TV box where you want without having to think about network cables and having 3 USB slots will make it easy to connect all your peripherals. Faultless sound can be enjoyed through the optical SPDIF port and allows you to hook up the best sound systems for an immersive movie and gaming experience. With Infrared remote control, a range of preinstalled software and apps as well as HDMI lead this home entertainment system is ready to go right out of the box. The MX Plus II Android TV Box comes with a 12 months warranty, brought to you by the leader in electronic devices as well as wholesale Android TV Boxes..